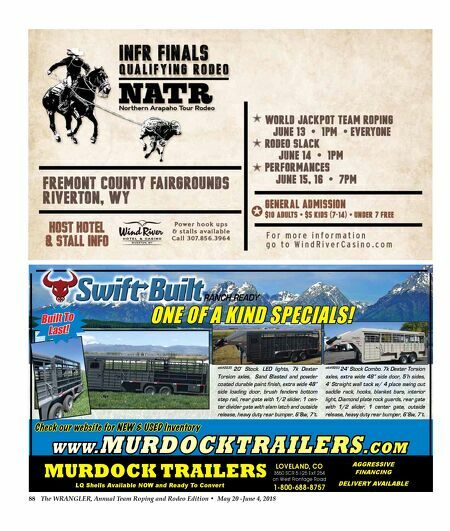 88 The Wrangler, Annual Team Roping and Rodeo Edition • May 20 -June 4, 2018 w w w. m u r d o c k t r a i l e r s . c o m Check our website for NEW & USED Inventory murdock trailers LQ Shells Available NOW and Ready To Convert LoveLand, Co 3550 SCR 5 I-25 Exit 254 on West Frontage Road 1-800-688-8757 AGGRESSIVE FINANCING DELIVERY AVAILABLE Ranch Ready stk#2035 20' Stock. Led lights, 7k dexter Torsion axles, Sand Blasted and powder coated durable paint finish, extra wide 48" side loading door, brush fenders bottom step rail, rear gate with 1/2 slider, 1 cen- ter divider gate with slam latch and outside release, heavy duty rear bumper, 6'8w, 7't. stk#8093 24' Stock combo. 7k dexter Torsion axles, extra wide 48" side door, 5'h sides, 4' Straight wall tack w/ 4 place swing out saddle rack, hooks, blanket bars, interior light, diamond plate rock guards, rear gate with 1/2 slider, 1 center gate, outside release, heavy duty rear bumper, 6'8w, 7't. One Of a kind specials! Built To last!